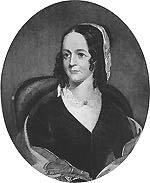 Telling the story of Godey's Lady's Book necessarily entails telling the story of its editor, Sarah Josepha Hale. Although the monthly bore the name of Louis Antoine Godey, who in 1830 founded the magazine and owned it until shortly before his death in 1877, its contents were for the most part the result of Mrs. Hale's editorial skill and ambition. In 1827, shortly after the success of her first novel, Northwood, the widowed Mrs. Hale was offered the editorship of the Boston periodical Ladies' Magazine. Remarking on this event in her preface to the fifth edition of Northwood, Mrs. Hale wrote, "This proposal was accepted, and the Ladies' Magazine established, the first literary work exclusively devoted to women ever published in America." [Finley, 39.] In her biography of Hale, The Lady of Godey's, Ruth Finley writes, "From the first issue of the Ladies' Magazine, January, 1828, to the last issue of Godey's Lady's Book edited by her, December, 1877, Sarah Hale's creed was 'the progress of female improvement.' In all her uninterrupted full half-century of endeavor she turned her eyes from that goal not for a day." With a circulation of 150,000 at mid-century, the Lady's Book became a became a cultural force of considerable influence; it was "the arbiter of the parlor, the textbook of the kitchen." [Finley, 22.] The part that Godey's Lady's Book played in the creation of the domestic ideal began in 1846, with the creation of a new department, "Godey's Model Cottages." According to Finley, "By 1849 the 'Model Cottage' department was firmly established. It swayed the fashion in homes just as surely as the 'colored embellishments' dictated the styles in clothes." In that year first appeared "Cottage Furniture" which extended the influence Godey's had over the look of the American home. The three articles below appear in Godey's Lady's Book in 1850. They are a small sample of the domestic recommendations made by Sarah Josepha Hale and her staff, resonant with the importance of domestic space seen architectural plan-books and domestic manuals of the time. articles from Godey's 1850 issues appear with many thanks to Electronic Historical Publications.